Are you still chasing the Super NES Classic retro video game console? For the love of all that is holy, just give it up already. You’re not going to find it in stores anytime soon. And you know what? It’s not even that cool! It only plays a handful of old SNES games and once you’re bored with them, you’re done. 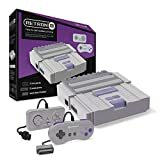 Instead of burning money on that little box just because it’s trendy, check out the Hyperkin RetroN 2 Gaming Console for SNES/ NES, which costs just $44 on Amazon. It plays game carts instead of only the games on its internal memory, and it has slots for both SNES and original NES games. Yup, that means you can play every SNES and NES game ever made on this awesome console.